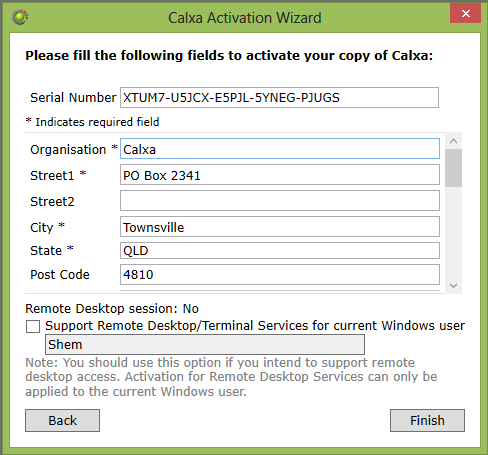 After you have installed Calxa on your computer you will need to activate it when using a local or network workspace. 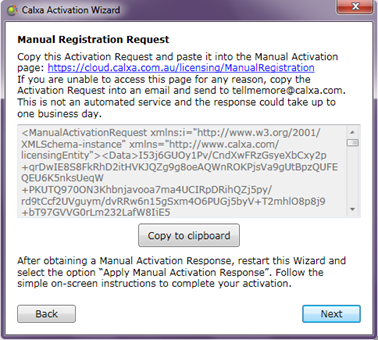 Activation is a process that verifies you have a legal installation of your Calxa software. To activate you will need your serial number, which can be found in your welcome email. If you would like to evaluate Calxa you can request a free trial. If you have purchased Calxa you should have received a serial number. This could have come in a welcome email or from your reseller. If you cannot locate your serial number, contact Calxa for assistance. 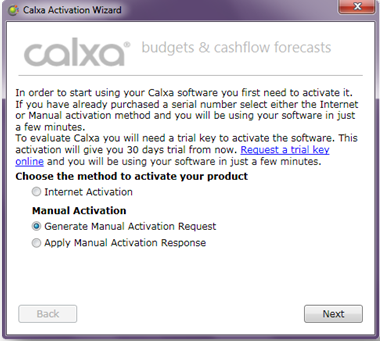 If you do not have Calxa license you can request a free trial. Press the Register button in the page that appears and you will see a serial number. Highlight this and copy so that you can later paste it into the Activation screen. Your trial period lasts for 30 days, after which you must purchase Calxa to continue using it. When you have a serial number you can choose between Internet or Manual Activation. Internet activation is usually quicker and simpler. Before attempting online activation ensure that you are connected to the Internet. In the registration form enter your Serial Number in the following format: XXXXX-XXXXX-XXXXX-XXXXX-XXXXX and your company/contact information. This information is required to provide you with support and updates to your software in the future. 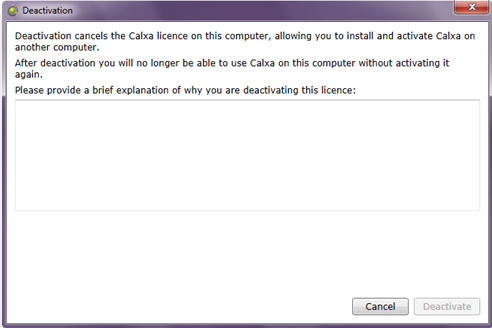 Generally we recommend applying the license to Anyone who uses this computer as shown below, although you may select Only for current windows user in which case the licence will not be active for other windows users. Note: If Remote Desktop session says "Yes" you will be forced tick the Support Remote Desktop/Terminal Services check box. In this scenario each user must activate individually. The only other occasion when this option should be selected is when you are the administrator accessing a server directly while end users will be accessing via Remote Desktop. Once again each user will need to activate individually. Use manual activation if you don’t have an Internet connection or network restrictions prevent you activating online. 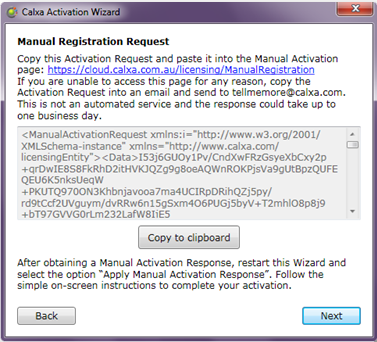 On the Calxa Activation Wizard screen under Manual Activation method choose Generate Manual Activation Request and click Next. In the registration form enter your Serial Number in the following format: XXXXX-XXXXX-XXXXX-XXXXX-XXXXX and your company/contact information. Click Next. Use the Copy to clipboard button to copy your Activation Request. Note: If you do not have an internet connection this can be done on another machine. Paste the Activation Request using the Paste from Clipboard button and click Submit. Note that the Paste from Clipboard button may not be available or functional from all browsers. In this case, Right-click in the box and Paste. Your Activation Response will appear, copy it using the Copy to Clipboard button. If you still have the Manual Registration Request screen open, click Next (skip next step). If you did not click next on the previous step and needed to start Calxa again, under Manual Activation method choose Apply Manual Activation Response and click Next. If you have copied your Manual Activation Response text it will be pasted automatically. 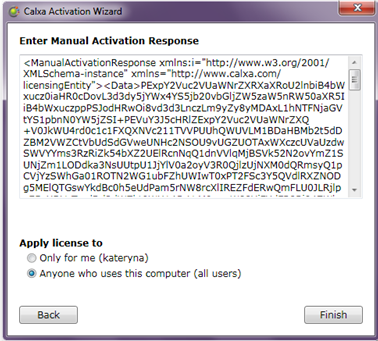 Select whom the license should be applied to and click Finish. If only users from one organisation are using this computer, it is advised to select Anyone – otherwise each user will need to activate. Note: Please see Internet Activation Step 3 above for more detail on the bottom licencing options. After activation has successfully completed, you will see your licence information: Serial Number, Activation Id (your activation identifier), and your last licence information. The licence list shows you information about current and past licenses. You may have several licenses listed under one Serial Number. Explain the reason of your deactivation and click Deactivate. If you work offline you will get deactivation response. Follow the wizard instructions and paste deactivation response in appropriate box. If your old computer is not available, please contact helpme@calxa.com with your organisation name and serial number and the reason for deactivation.